This four-tier cake features cakes of different flavors – looks like chocolate and vanilla – with gorgeous white icing between the layers. 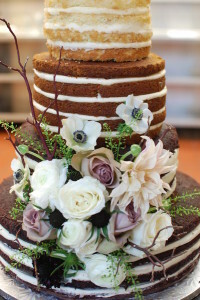 Not only is this cake elegant but the stark white icing really pops when you look at the cake. And the addition of the gorgeous fresh flowers is perfect for this time of year. 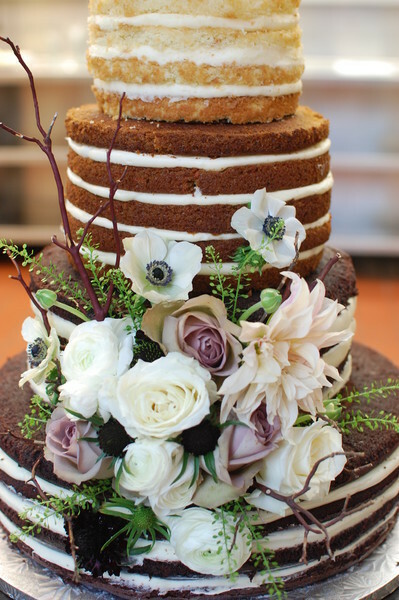 The white and purple blooms play nicely with the colors of the cake. Of course you could always pick different colors. You can find this cake here. It was created by Sugar Fixe Patisserie.